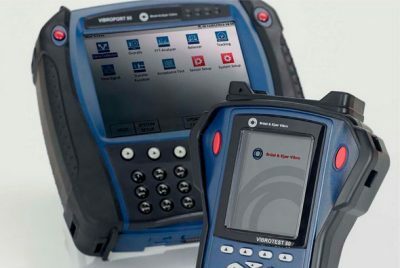 VIBROPORT 80 and VIBROTEST 80 are the newest generation of portable measuring instruments. They are designed with powerful diagnostics and analysis, balancing and condition monitoring capability, these all-purpose instruments are easy to use flexible enough for a broad range of applications with modules for specific requirements. The two instruments can perform all of the same functions. ·VIBROPORT 80: With its large screen is perfect for in house measurements, The large screen also allows two-plane polar plots to be easily viewed. ·VIBROTEST 80: A more compact, lightweight version of the VIBROPORT 80, this instrument is ideal for field analysis/balancing. It provides fast and easy route-based data collection, monitoring the condition of machines, and balancing. The VIBROPORT 80 and VIBROTEST 80 come in several ready to use starter packages with optional additional modules available to add on at any time to meet your monitoring requirements. ANALYZER PACKAGE: The analyzer package includes powerful vibration analysis for general machine condition. This package merges the two main modules for typical applications in the machinery diagnostics day to day business: Overalls Module and the FFT-Analyzer with the Report & EXaminer Software (ReX). To diagnose the location and severity of common faults in rotating machinery (e.g. generators, turbines, fans, aircraft engines, pumps, compressors, motors), the FFT-Analyzer is the appropriate application module. BALANCER PACKAGE: The balancing package makes field balancing easy. Unbalance occurs in nearly all types of rotating machinery. With one or two plane field balancing the following machines can be balanced by means of the Balancer Module and Overalls Module with the Report & EXaminer Software (Rex). The VIBROPORT 80 and VIBROTEST 80 portable handhelds combine application versatility with a modular product concept that is easy to use by specialists and beginners alike. Some additional features that are available to add on to any package are shown below. For optimal operation of a machine, it is important to avoid (or minimize the duration) of the coincidence between the rotational speed and the structural resonance frequencies. This will minimize high vibrational loads during the run up, coast down or steady-state operation of the machine. The data will be saved in a *.wav format, which can be processed by the Report & EXaminer Software and other types of analysis software.